Ever since its defeat in World War 2, Japan has officially been a nation without a military having adopted a provision in its constitution – Article 9 – that renounced war and forbid maintaining the potential for war. But after more than six decades, there are signs of shifts in Japanese attitudes, and elections on July 21 to choose half of the members of the the upper house of Japan’s Diet may have an impact on whether it is changed. Talk about changing Article 9 – a move long sought by Japan’s conservatives and opposed by both China and South Korea – comes at a time when the country has been more assertive in regional security matters, such as its territorial dispute with China over islands in the East China Sea.. The fate of Article 9 may depend on how well the ruling Liberal Democratic Party fares in the July 21 election. If the LDP obtains a two-thirds majority, they would be in a position to amend the constitution to enable Tokyo to play a more active military role around the world. Even though Japanese voters say they will back the LDP in the upcoming election, they reject amending the constitution. 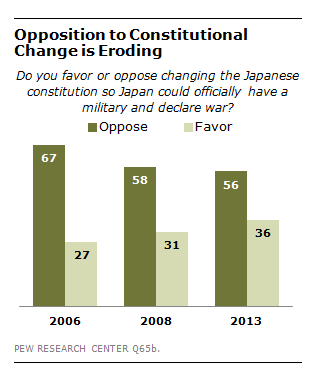 A majority (56%) opposes Japan officially having a military and the ability to declare war. But that opposition has declined by 11 percentage points since 2006, when 67% were against constitutional revision. Such findings may be one reason why Abe advisers say that, whatever the outcome of the July 21 vote, they may forego any effort to formally amend the constitution. Instead, they may simply interpret Article 9 more broadly, to enable Tokyo to play a larger military role in the world. Japanese attitudes toward Japan’s strategic posture are evolving. For some time there has been a robust public debate within Japan about whether Tokyo needs a military capacity and a willingness to engage in security operations commensurate with the country’s stature as the world’s third largest economy. But such ambitions have long been constrained by Japan’s post-World War II constitution, which was specifically worded to limit that role. Notwithstanding such strictures, Japan does have a large Self-Defense Force. And, in recent years, these forces have been deployed internationally to provide humanitarian assistance and in peace keeping operations sanctioned by the United Nations.